We left Warderick Wells at 0830 today and arrived in Staniel Cay at 11:45 traveling with Southerly II and Interlude. The wind got as high as 25 kts and was at a perfect angle for sailing. We turned off the engines and were sailing at 6.5 kts. However, I was washing clothes, baking English muffins on an electric griddle, watching TV and we were making water, so we needed some charge from the engines. Therefore, we ran one engine at low RPMs and motorsailed at 8.7 kts. Above is a picture of the anchorage we had in the north field at Warderick Wells. Seas the Day is not in this photo because we were around the bend on the left and a small hill was hiding us from where we took the picture from on Boo Boo Hill. We returned our sign with ’13 next to the 2010 and screwed it into a piece of wood under two other boat signs. The signs get scattered after being carefully placed by cruisers, so we made sure ours wasn’t going anywhere. We left Warderick Wells without snorkeling. The wind and current were too strong, so we will try to stop there again on our way north in a few months. We decided to skip Cambridge Cay, which is also in the park and has excellent snorkeling areas. We also passed several other cays where we want to snorkel and hike on the trails but will return when the weather improves. We are anchored next to Big Majors. 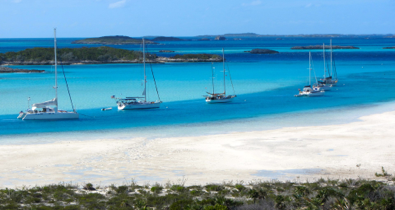 It is a popular place to anchor because it is well protected and just around the corner from Staniel Cay. The photo at the right is from our boat in the large anchorage. There are dozens of boats here and many stay for weeks, if not months. The advantage of being here is there is a marina at Staniel Cay which has a restaurant, water and fuel. There are three grocery stores. The blue store and pink store are named after the color of the small houses they are in, and Isles General, which is a small store, but has a few groceries, some hardware and other miscellaneous products. We stopped in there today and the boat that brings food to them once a week had just arrived so we had our pick of fresh vegetables. For such a popular stop, it is strange that there isn’t a larger grocery store here. The next one we can go to will be in Georgetown. Staniel Cay is where some of the James Bond movie Thunderball was filmed. When the wind dies down, we will be snorkeling in the grotto used in the movie, which has fantastic sea life in it. 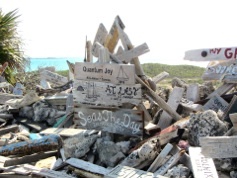 Another reason people like to be near Staniel Cay is it is the best place in the Exumas to have visitors fly in. There is a direct flight daily on Watermakers Air out of Ft. Lauderdale to the Staniel Cay Airport. The plane holds nine passengers and has a large cargo pod. Many cruisers, as well as resorts, businesses, and residents have mail and parcels sent here on the daily flight. The phone signal is great and so is the wifi signal. 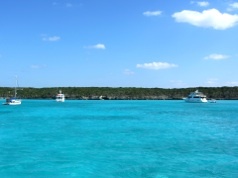 We are quite a ways from shore, but are getting a very good signal for the Exuma Wifi Network using our wifi extender. We paid $55 for 1.5 GB for seven days. They also have other plans, such as $10 for 200 GB for 24 hours and a number of other options. This will get us through until our air card arrives this week. Then, we will pay $40 a month for 5 GB using the Batelco signal.